They only sent four 12x24 (i think) sign holders to us. So far it's not been a problem. Almost done setting so I'm hopeful. Try AX6533. It is a 12x36 transcend lit signholder. Good to see I am not the only one who didn't get this fixture! I noticed some dont show up in the pog when I audited, some says reserve. MakeUpGeek sent wrong version. I recycled anything I didn't receive. Unfortunately, I have twice as much. 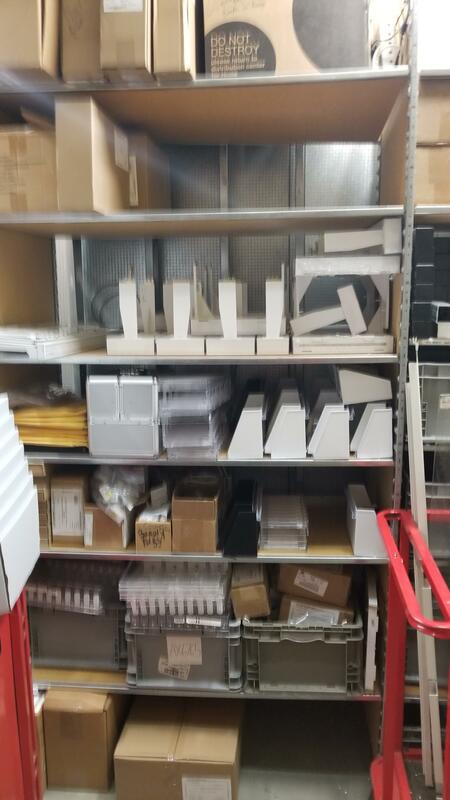 We are boxing 90% of it up in repacks and storing in the electronics stockroom in the top shelf. Only keeping out a few dividers, peg hooks, and dividers. Ours supposedly came in DTS on Saturday or when the receiver wasn’t there.... but we’re pretty sure someone put them close to our crc or salvage and they disappeared. The STL said he saw them. Tiny box with a label that said “clips” or whatever. Has anyone received their mops/brooms pegs? I just mysupported them cuz.. yeah. Not gonna set without them. Boo. Love, Love, Love that we didn't have to reuse old bullnose ISM. That came in like a month ago DTS. I KNOW RIGHT. I'm only missing about 20 things throughout the entire department. Can someone confirm whether clips or adapters came for ceiling displays? I asked everyone but no one has seen it. I left at 2:30PM and my pallet still hadn't arrived by then, so I have no clue. Nothing on the signing pallet for clips or adapters (you will only get adapters if you have track lighting above your flat). I ended up using a regular spider clip and a 12 inch wire to make my own clip. Wrapped the wire around the ceiling fixture holder and clipped both ends into the spider clip, then attached to the ceiling like normal. Was so glad I was able to get everything moved around on the flat in one day and get the displays/signing up. Was worried it would take two. The regular ceiling clip we use for hanging ISM from the ceiling. They are called spider clips....or used to be called that on SAP so that's what I still call them. For clarification purposes, who is responsible for setting the Valentine floral by the check lanes. Particularly the set that had the pallet corners which held the cardboard poles that held the ISM. I assembled the bits and pieces of ISM, ready to go, but apparently I am now also a florist, according to a really stressed out tl. I find a lot of "you touched it last, so now you have to do the entire project". Hard to do with no hours to do so. I think it's an ASANTS thing. At my store any floral that comes in is for the grocery TL to put out. I build the signing for it after she has everything in place. Pretty sure at this point though, I will not build any of it at all, doesn't seem worth it for 4 days and I've got bigger things to attend to. So if she wants it up, she can build it. I just tossed mine. The last two sets (I built) my tl just flexed the product. They flex it before the signing. It's a spln technically. Gstl and consumables tl should share it. I take care of the ism but my produce TL sets ours. Anyone know if those little plastic clips that go on the "knuckle" signholders are able to be ordered by themselves? Can't find an item number, would be super useful if I could get some of those because I only have a few signs left that have them. GOD I am so glad I don't have endwalls anymore.